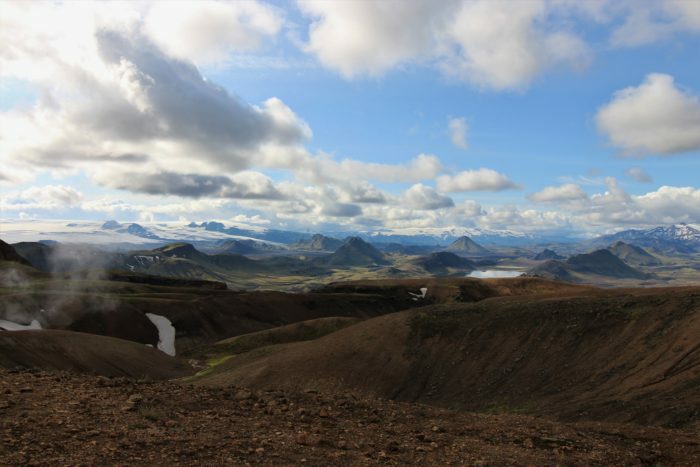 The Laugavegur Trail is a 36-mile trail stretching across southern Iceland, featuring a terrain diversity similar to the PCT: desert, glaciers, mountains, and forests. Imagine you somehow combined Mordor and the Shire, and that mental image will come close to approximating the beauty of the moss-covered volcanic peaks this remote trail traverses. The trail can be done in as short as two days, or as long as six depending on how far you want to go in a day and how many of the side trails you want to explore. Furthermore, the Southern Terminus is connected to an additional 14-mile Fimmvörðuháls Trail which takes you up a mountain pass between the Eyjafjallajökull and Mýrdalsjökull glaciers, then down past beautiful waterfalls to the seaside town of Skógar on Route 1 (AKA the Ring Road). It looks like we’re sitting in front of a giant postcard. It actually looks even more incredible in person. (Mýrdalsjökull and Eyjafjallajökull glaciers visible in the background). Image courtesy of Rebecca MacKay. Terrain | Moderate, a few minor mountain climbs and descents, but largely flat. 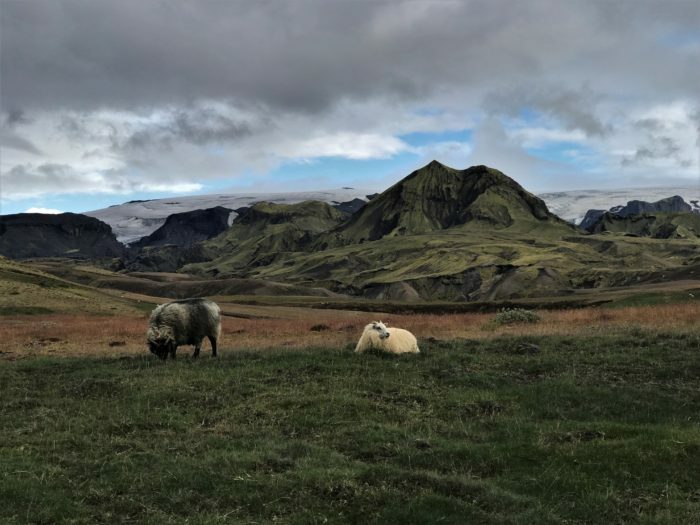 The open season for the facilities (and therefore the trail) are determined by the Icelandic Road Authority, dependent on road conditions and snow levels. Generally, the huts will be open between June 25th and September 17th. The trailheads are very remote, so you will either need to take a bus or drive to the trailhead. You can get busses to Landmannalaugar, Þórsmörk, and Skógar though Reykjavik Excursions or Iceland By Bus. It is important to note that some of the busses run on reduced schedules (or not at all) after August 31st. 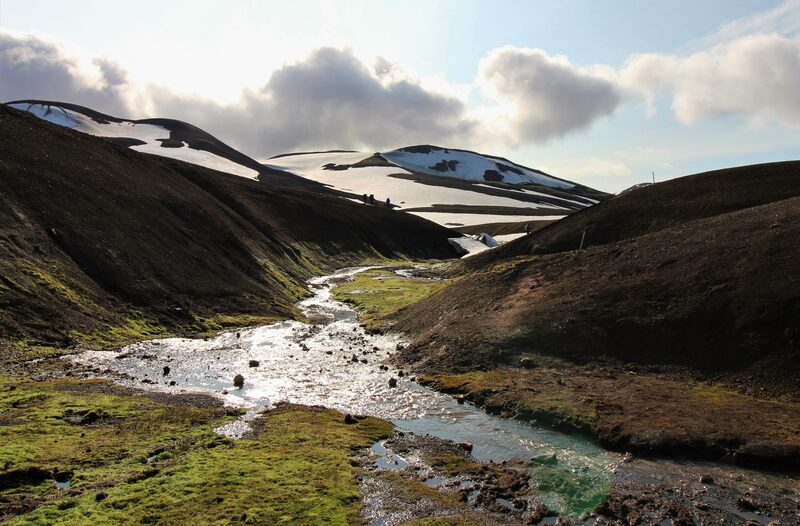 If you are driving to Þórsmörk, you will need to cross several rivers including the infamous Krossá. When leaving Þórsmörk on the bus, we came across a Fiat that someone had decided could cross a river several feet deep which had, unsurprisingly, gotten stuck in the middle of the river. We towed it out using our bus. Only robust 4×4 vehicles should attempt this drive. We just sat here and looked at it for a while. It looks so surreal. Photo courtesy of Rebecca MacKay. Obviously, you can see the view by looking backwards when going NOBO, but this way you look down into the valley as you progress. The other reason most people go SOBO is because the elevation is slightly easier in that direction. Þórsmörk or Skógar are good places to end the trail because of their amenities, but Landmannalaugar has the only hot springs on trail, so an argument could be made for ending there. Photo courtesy of Rebecca MacKay. Hiking this trail is like stepping through a portal to a fantasy world. You will traverse massive lava flows with steam vents spurting out from every niche. Obsidian shards litter the ground, and the volcanic rock has hardened into almost Doctor Seuss-esque blobs and mounds. After crossing a black sand desert, you will crest a rise and see the rest of the trail laid out before you. The mountains look surreal, a vibrant green from the moss that covers the volcanic rock. 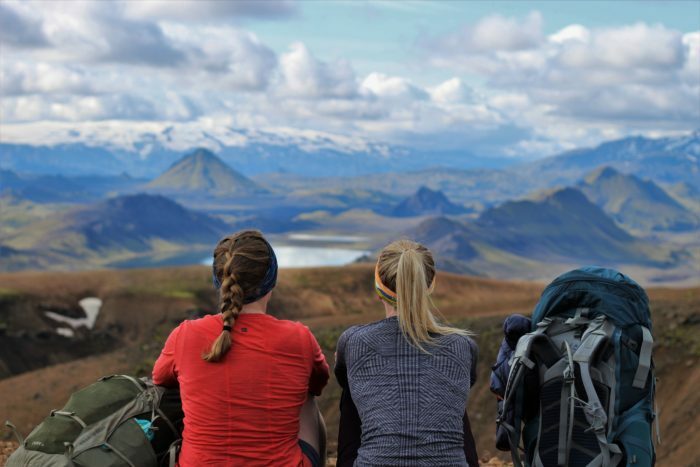 The Laugavegur Trail is a short hike, but you can add day hikes to flesh it out into a longer trip exploring the remote southern interior of Iceland. Iceland is not a cheap place to vacation, but camping in its beautiful backcountry is a good way to save money while experiencing a wholly different terrain than near home. It’s absolutely breathtaking. The terrain of the trail is not overly difficult; most of the trail is well graded, but there are a few short scrambles where you need to head directly up a steep slope. 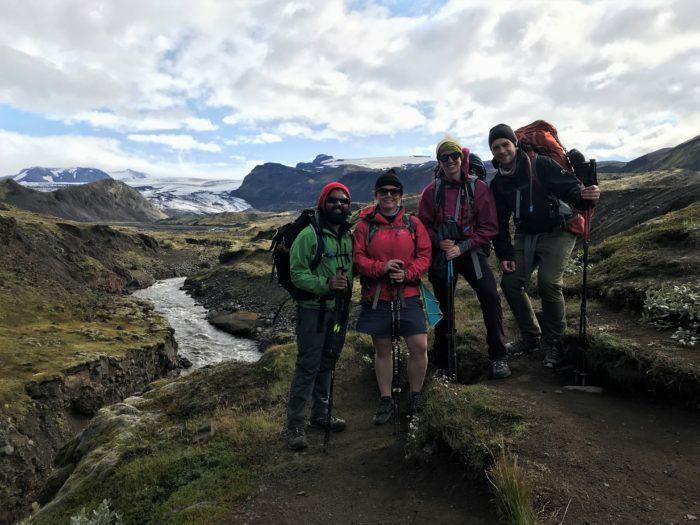 Hiking in Iceland tends to be limited by the season, meaning that you should not intend to traverse the Laugavegur Trail outside of the June 25th and September 17th window without serious experience in winter hiking and adequate preparation/gear. Even within the season, you can expect to see a variety of weather. I hiked it August 23-26 and experienced rain, hail, fog, and winds in excess of 56 miles per hour. If the weather is too serious, like the aforementioned wind, the trail will be closed. My legs were cold. Photo courtesy of Rebecca MacKay. The key to gear for the Laugavegur Trail is layers. You can experience a variety of weather over a very short period of time. Rain gear is 100% essential. Here is my gear list from my late-August hike. Overall, I was happy with that gear, but if I did it again I would definitely bring pants. I did not carry pants and was chilly some days, especially when it rained. If you bring excess luggage on your vacation but dont want to bring it on trail, it can be left in luggage lockers in Reykjavik. The Iceland Travel Association (Ferðafélag Íslands) runs huts along the trail (between 75-90 USD/person), and the distances between huts ranges between 2.5-9 miles (4-15 km). Camping on trail is not allowed, but hikers are welcome to camp at the huts. All of the huts offer potable water, toilets, cooking facilities, picnic tables, camping facilities (approximately 18USD/person) and a wardens office where you can get information. Book your huts well in advance – I booked 6 months ahead and had to change my travel dates because some nights were already booked up. All of the huts except for Hraftinnusker also offer showers (approximately 4.57USD for 5 minutes). Pro tip: double up with your partner (or a really good friend) for longer and more cost-effective showers. Landmannalaugar is located in a wide river valley surrounded by mountains and craggy lava fields. Steaming creeks join together to form a large hot spring, normally full of hikers. There is lots of camping space, and sheep wander freely around the camp. There are huts, maps of the trail, and converted school buses that serve as a small store. 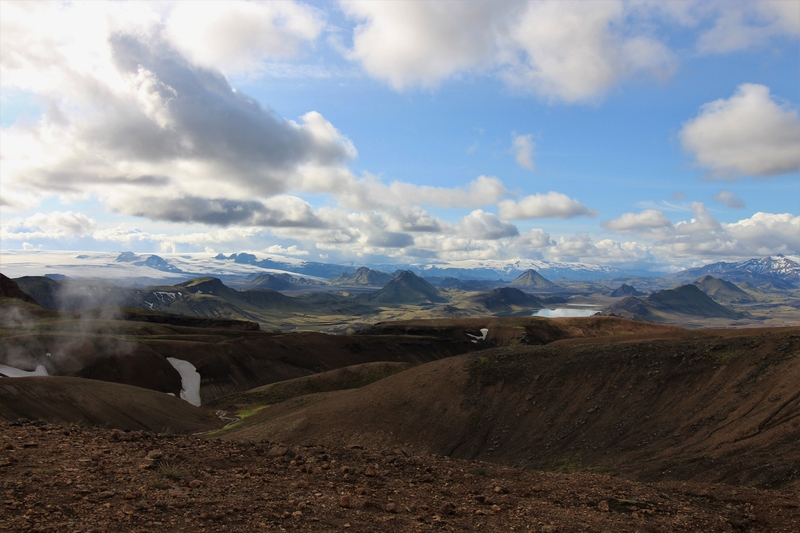 Not far below the volcanic peaks, Hraftinnusker is nestled in a high valley, looking upon glaciers and steam vents. The tent sites are surrounded by man-made rock walls which shelter them from the winds whipping through the valley. This is the most remote stop on the Laugavegur trail, so there is no power in the huts here and all garbage must be carried out. There are a few minor river crossings in this stretch, though they can be expected to be much higher in melt season. Be careful on snow bridges across glaciers, especially later in the season. Some of the ones we crossed looked questionable, so we decided to cross them away from the trail. Álftavatn huts are located next to a large lake. The campsites located right beside the lake and are very exposed to high winds that tend to blow through. If youre going to cough up for a hut on the trail, this would be a good place to do it. This site has a restaurant which sells expensive, but very hearty meals and drinks. They are diet-conscious there, offering meals with vegan or gluten-free options. There are also some cards and board games there for hikers to use. The rest of the trail from here is relatively flat. Hvanngil huts are not far from Álftavatn, so they may be a good choice if Álftavatn is full. The camping here is slightly more sheltered and may be a good choice on a windy day. There are two river crossings between here and Emstrur. This section is very flat as you traverse a black sand desert. It is very exposed and can be very windy. There are sheep everywhere on trail. Everywhere. They roam free and will occasionally BAAAAHH loudly outside your tent early in the morning. Photo courtesy of Rebecca MacKay. You dont see Emstrur until you are almost there, as it is hidden at the base of a hill crested on the way in. Look out for the cell satellite on top of the hill for an idea of when you are close. Emstrur has a covered kitchen tent for hikers to use and is located at the base. Soon after Emstrur, you cross a bridge across a deep river canyon and from there the trail follows that river all the way to Þórsmörk. Not long before Þórsmörk is the only major river crossing on this trail. There are several safe fords at which to cross, but be sure to take the time to select a good crossing site. 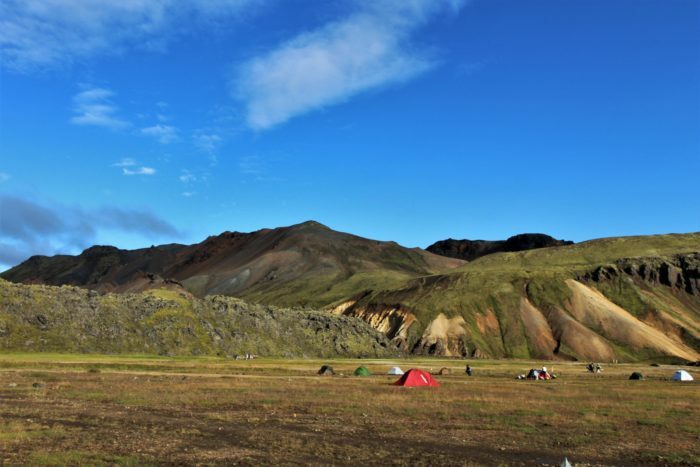 Þórsmörk accommodations are hidden in a wooded valley, making this the most sheltered camping on trail. There are three different locations in the Þórsmörk Nature Reserve where you can stay, so you may need to hike an additional mile or two to get to camp. There is a sign at a trail juncture that branches out to the three locations. Þórsmörk Huts and the access road to the trailhead. Photo courtesy of Rebecca MacKay. 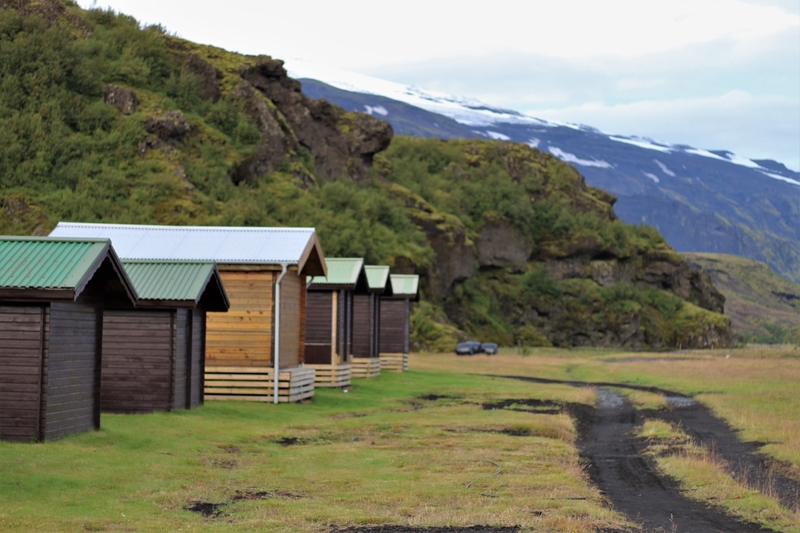 Volcano Huts, located in the Húsadalur Valley, offer multiple types of accommodation including small cottages, dormitories, glamping, and campgrounds. The camping here is slightly more expensive (~23.60 USD), but includes unlimited hot showers. They have a sauna, a swimming pond, a restaurant with all-you-can-eat buffets and free WiFi, hiker boxes, and a room where hikers can hang out and charge their devices. Unlike the rest of the huts on trail, Volcano Huts are open year-round. Langidalur hosts the same huts at the rest of the trail (run by Ferðafélag Íslands). It has a basic store. Basar has huts and a store. The trailhead to Skógar (Fimmvörðuháls Trail) starts here. There is a hut run by Ferðafélag Íslands partway through the trail called Baldvinsskáli. It has limited facilities, and offers no running water. As you descend into Skógar, be sure to check out the beautiful Skógafoss waterfall. There are many streams along trail and water taps at every hut. All of the water on trail is glacier fed and supposedly safe to drink, so I did not bring a filter on this trip, but it’s generally a good idea to filter all water in the backcountry. 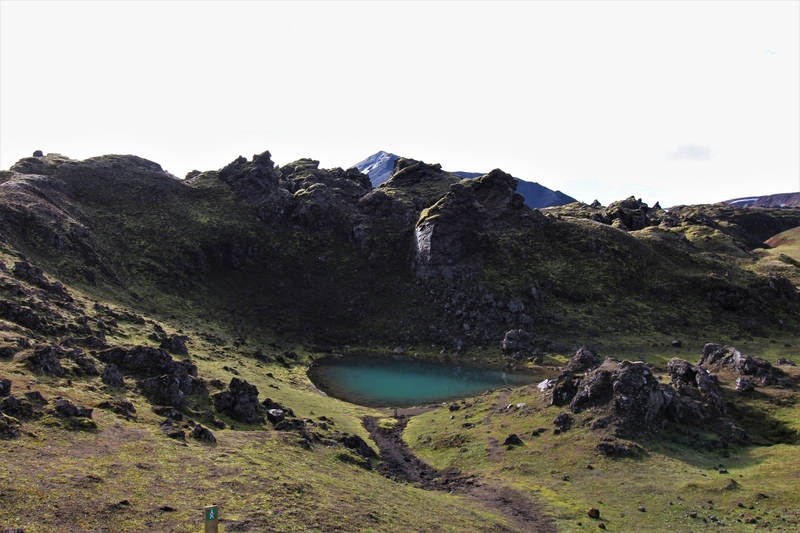 This trail is short, but bus companies will deliver resupply packages to Þórsmörk for a fee. You can also buy some dehydrated meals and camping fuel at the wardens’ huts. 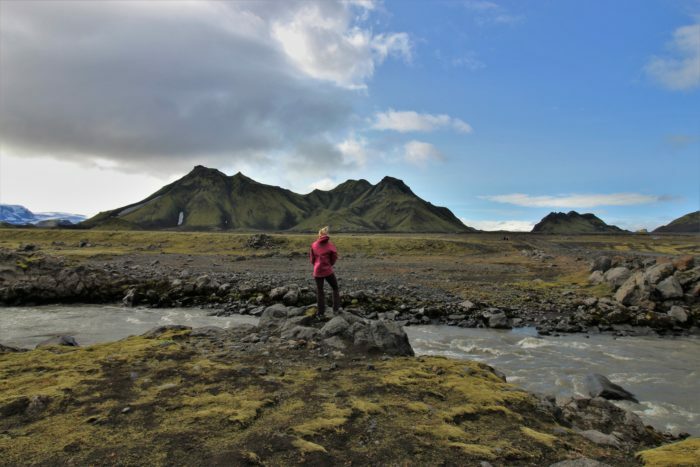 The Laugavegur trail is an incredible experience for those looking to be blown away by beautiful and unusual terrain. If you stay in huts the entire way, you can almost slackpack the trail since you won’t need shelter or cooking gear. It is a great choice for anyone looking for a short hike in Iceland, either as part of the Ring Road tour or as a part of a shorter trip. Note: Prices in USD are approximate and will depend upon exchange rate. This way your hike will start at Rjupnavellir. Youll pass Afangagil and Landmannahellir before reaching Landmannalaugar. Rjupnavellir is reachable by bus from Reykjavik, just like is Landmannalaugar.